Grassroots International works in partnership with social movements to create a just and sustainable world by advancing the human rights to land, water and food through global grantmaking, building solidarity across organizations and movements and advocacy in the US. How do you do your funding and please describe your organization’s approach and process, explaining how it is different from conventional philanthropy. Since 1983 it has been our strategy to form lasting partnerships with some of the most vibrant and effective movements and organizations in the world. Our long-term, trust-rich relationships are built on shared vision and values, mutual commitments, reciprocity, transparency and trust. Our partnerships recognize that change is successful only when people in their own communities organize to confront the root causes of their problems.Grassroots International’s approach to grantmaking (and advocacy) is grounded in the belief that social change rooted in justice is created by visionaries working together, building communities, organizations and movements. Once we make a commitment to an organization, our process is to ask them how they want to use the funds we provide – this way, they are the ones who determine what we support them for and they have the flexibility to apply the funds in the way that is most useful to them. In this way, our grants are not about supporting specific projects as much as accompanying partners toward a common, long-term vision for global justice. Grassroots International is fortunate to have functioned this way since its beginning. In 1983, our founder Dan Connell was working to develop a program in Lebanon for Oxfam America. When the political context in Lebanon became challenging and Oxfam America decided it wasn’t the time to go in, Dan and some colleagues decided to stay and keep working with local groups there. They founded Grassroots International to intentionally support social justice movements, initially in the Middle East, the Horn of Africa, and Apartheid South Africa. From the beginning, our biggest influences have been the social movements with whom we have partnered. We learn a great deal from their work, including their successes and setbacks, how they work to overcome them and how they are building a vision for justice from a local and national to a regional and international level. There are some people and institutions in philanthropy that have been resistant to our model of long-term commitments to our partners. Some of them believe that funders should cycle groups off of their dockets after a certain number of years, with the idea that it pushes groups to be more “sustainable.” However, we have a different view of what sustainability means. When we partner with social movements, it means recognizing that fundamental structural change takes multiple years and even decades. In order for social movements to sustain this work, they need funders who will make the commitment to continue funding them over the long-term.We also recognize our own responsibility as a funder based in the U.S., because often it is the U.S. government and corporations that are the cause of human rights violations around the world. Therefore, it is our responsibility to stay with movements for the long haul — not out of charity or aid, but out of a relationship of solidarity grounded in shared values. One of our greatest challenges as a public charity is finding ways to raise money each year for the kind of long-term, ongoing work we do with our partners, especially in difficult economic times when our partners often experience cutbacks from other funders. We cannot just change on a whim to follow “hot” trends in philanthropy, nor do we want to, but that means generating resources is sometimes a challenge. Because we’re committed to our partners for the long-term, we have taken up the additional role of sharing information with and educating other funders about why long-term, movement building work continues to be important. It means we are constantly seeking ways to raise resources from a variety of sources, including individuals and major donors who believe in movement building as a significant part of our fundraising strategy.In the 1990s, Grassroots International began making a major shift in its work, as a result of what we were learning from our partners. It became clear that global economic forces were playing a major role in shaping the realities for people all over the world. To be relevant, we needed to address more than national struggles alone, to work with movements that were coordinating at international levels to resist global forces, while still being rooted at the grassroots. This is what we describe as our “broad and deep” strategy. This process included the creation of our Mexico program area in 1993, just before the implementation of NAFTA, and the expansion to our Mesoamerica program area in 2006, coinciding with the passage of CAFTA. 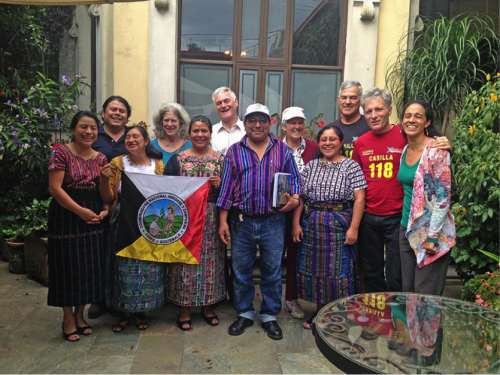 It culminated in the development of our Resource Rights mission focus, bringing all of our work into alignment around support of movements of peasants, indigenous peoples and women in the struggle for resource rights, food sovereignty and climate justice. Based on our partners’ feedback, we have also become more and more engaged with U.S. advocacy and alliance building work around these same issues. While any of our grants to partners lead to important gains, the larger impact comes from the consistent long-term support and solidarity we share with our partners. Accompanying social movements to strengthen their leadership, capacity, and power leads to fundamental, structural change that addresses the root causes of problems.For example, Grassroots International has been a partner with the Landless Workers Movement (MST) in Brazil since 1998. In the 30 years of the MST’s history, including 17 years as a Grassroots partner, it has reclaimed over 17 million acres of previously unproductive land. This land now feeds and is home to 350,000 rural families in Brazil and many more in surrounding urban communities! Grassroots supports a combination of different strategies that have contributed to the MST’s astounding success. Sustainable Livelihoods: Grassroots supports the MST’s National Agroecology Training program and local on-the-ground practice of agroecological production, so that MST leaders in various settlements can learn and share practices to produce food for their families and communities in a way that is healthy for people and the environment. Movement Building: The MST organizes landless families to reclaim land that is not being used, so that they can live and produce food on this land. They mobilize to push for government recognition of the rights of landless peoples, through a combination of direct action and policy work. They do deep, intentional leadership development work, especially with women and youth, in order to prepare their members to do the intense organizing required. They also work with other organizations in Brazil, in South America and internationally, building a broader movement. Human Rights Defense: With all of the nonviolent resistance and movement building work that MST leaders do, they are confronting powerful corporate interests and elites. As a result, they often come under severe pressure and face criminalization and physical threats to their lives — all too often including the killing of MST activists. For this reason, human rights defense — including documentation of human rights abuses and legal strategies to defend threatened activists — is a critical component of both MST’s work and Grassroots’ role in accompanying the MST. The most important insight we have gained, and the best piece of advice we’d give to other funders, is around the critical importance of accompanying movement building processes for the long haul. Specifically, this means:… working with organizations that have a clear analysis of the root causes of problems, and have a shared vision for how to address those root causes, organizations with a base working in the most impacted communities and organizations which support and take leadership from those groups. …making long-term commitments and taking time to build deep relationships with each partner. …listening to our partners. We ask what they need and tailor support to that. While impact is important, we also need to expect setbacks – that’s part of what happens when groups are pushing for structural change. It’s important not to get too caught up in the trees that you lose sight of the forest. The bigger impacts will come with time. In the meantime, we learn along with the organizations with which we partner. …engaging in honest dialogue with partners. We ask them for feedback about our own work as a funder, including what else we can do to accompany their work besides funding. This the context in which our partners pushed us to do more work to educate others in the U.S. about their situations and to directly engage in advocacy and alliance building with groups in the U.S. with similar goals. In addition, we are not a “doormat” — we come to the relationship with our own values. Having mutually held and agreed upon values forms the basis for our partnerships. …supporting intersectionality. So many issues are inter-connected (i.e. food, water, extraction, climate, health, etc. ), but too often, funders structure their support in such a way that groups are forced to work in silos. Social movements know that their work is more effective when they recognize those connection and we need more funders to support that cross-pollination, including learning exchanges. We are not only a funder, but are also engaged alongside our partners in common work toward our shared goals and vision of global justice. Because of the kind of long-term relationships we have with our partners, they have placed their trust in us and include us in discussions where they reflect on their past work, as well as when they develop strategies for the future. We likewise have placed our trust in them, and feel a sense of accountability to them and to the broader movements of which they are a part. This reciprocal relationship has pushed us to grow and to take on additional roles beyond funding – including raising awareness in the U.S. of the struggles and solutions from social movements in the Global South, and getting involved in campaigns that build solidarity between these struggles and the efforts of impacted communities in the U.S. For example, based on the insight and direct advice from our partners, Grassroots International is a founding member of the U.S. Food Sovereignty Alliance, an active member in the “We Divest” coalition, pushing for divestment from companies that profit from the Israeli Occupation, and an active member of the Climate Justice Alliance, bringing U.S. communities impacted by climate change together to push for a Just Transition away from extreme energy and toward local, living economies and community resilience. We are honored to be able to play these roles, and connect US allies working toward rights to land, water, food sovereignty and climate justice with the struggles and strategies of our Global South partners.